The Director of the Bureau of Public Works (BPW) turned over to the National Housing Authority (NHA) a completed water works system in San Gabriel, Carmona, Cavite (now General Mariano Alvarez, Cavite). The NHA turned over the water works system to San Gabriel Water Services Cooperative (SAGAWESECO), now GEMASCO. A labor case for illegal dismissal was filed against GEMASCO. Th Labor Arbiter (LA) ruled that the complainants have been illegally dismissed. It then ordered GEMASCO to pay their separation pay and backwages. The ruling became final and executory after it was affirmed by the National Labor Relations Commission, the CA, and eventually by the Court. As a result, the LA issued a Writ of Execution. Pursuant to this writ, the sheriff issued a Notice of Garnishment as well as a Notice of Sale/Levy on Execution of Personal Property. Thus, GEMASCO instituted a petition before the CA, contending that among the properties to be sold at the public auction were three (3) water tanks, the ownership of which is the very subject of G.R. No. 175417 where GEMASCO attacks the validity of the Deed of Transfer and Acceptance entered into by the NHA and GMAWD. It then prayed that until a final judgment is rendered in G.R. No. 175417, the LA and the sheriff should be prohibited from auctioning said water tanks. GMAWD agreed with GEMASCO and prayed that the petition be granted. It claimed that the contemplated auction sale of the subject water tanks will be prejudicial to it considering that its right over them had been consistently upheld in the courts below. The CA dismissed GEMASCO’s petition, prompting both GEMASCO and GMAWD to move for a reconsideration, which were subsequently denied. Hence, GMAWD filed the present petition before the Court, docketed as G.R. No. 198923. It contends that the CA erred in affirming the issuance of the LA’s Writ of Execution as well as its Notice of Sale/Levy on Execution despite the pendency of G.R. No. 175417 before the Court. It argues that said issuances will cause it great injustice because the same are against properties the right of ownership over which has been consistently upheld in its favor. Should the three (3) water tanks be included in the Writ of Execution? The three (3) water tanks should not be included in the Writ of Execution. The water works system in General Mariano Alvarez, Cavite, including the three (3) water tanks subject of the assailed Writ of Execution in G.R. No. 198923, is devoted to public use and thus, property of public dominion, which GMAWD has the right to operate, maintain, and manage. 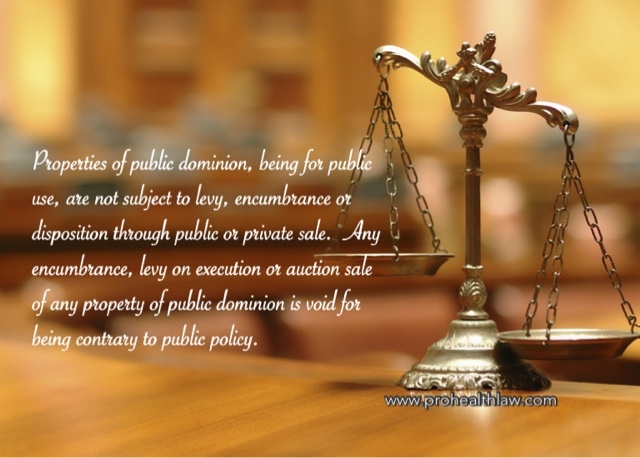 Properties of public dominion, being for public use, are not subject to levy, encumbrance or disposition through public or private sale. Any encumbrance, levy on execution or auction sale of any property of public dominion is void for being contrary to public policy. Otherwise, essential public services would stop if properties of public dominion would be subject to encumbrances, foreclosures and auction sale. Since it is GEMASCO which is liable for the payment of the separation pay and backwages to its illegally dismissed employees, any contemplated sale must be confined only to those properties absolutely owned by it and the subject water tanks must corollarily be excluded from the same. GENERAL MARIANO ALVAREZ SERVICES COOPERATIVE, INC. (GEMASCO), Petitioner, v. NATIONAL HOUSING AUTHORITY (NHA) AND GENERAL MARIANO ALVAREZ WATER DISTRICT (GMAWD), Respondents. DISCLAIMER: The author takes no responsibility for the validity, correctness and result of this work. The information provided is not a legal advice and it should not be used as a substitute for a competent legal advice from a licensed lawyer.